Hello friends! Welcome to the end of summer. Uh, wait. What! Not exactly sure how that happened, but this summer somehow came and went in a heartbeat. The good news is we can begin thinking all things fall starting with the family meal movement that will culminate in September with National Family Meals Month™. As the association of food retailers, it is the mission of the Food Marketing Institute and its Foundation to highlight the role of grocers and to bring our industry together around a family meal movement encouraging one more meal at home per week. We are enjoying every single minute of this special event because family meals eaten at home have been proven to benefit the health and wellness of children and adolescents, to fight obesity, substance abuse and to make families stronger. In turn, this helps create a positive impact on our communities and our nation as a whole. If you think about it, it is pretty amazing that simply taking time to sit down and eat dinner with your family can make such a HUGE impact on the world. And if your families are anything like ours, it’s almost like a modern day miracle to get your entire family to put their cell phones for an entire meal (#LOL) ha! On a more serious note, Hormel products are key ingredients to helping you make quick and easy family meals. Since they are convenient, they make it possible for you to have more meals at home, with your family. One of our favorite quick and easy family meals is Simple Breakfast Muffins. This delicious recipe takes less than 20 minutes from start to finish and feeds a small crowd (also known as a family). The best part is the REAL BACON FLAVOR. We always make these with HORMEL® Bacon Toppings to enhance the muffins with the delicious flavor of 100% real bacon. We don’t even have to force our families to the kitchen when these Simple Breakfast Muffins are in the oven. One whiff of bacon and the family comes running in begging to eat! Preheat oven to 450(F) degrees and prepare a muffin pan with non-stick spray. 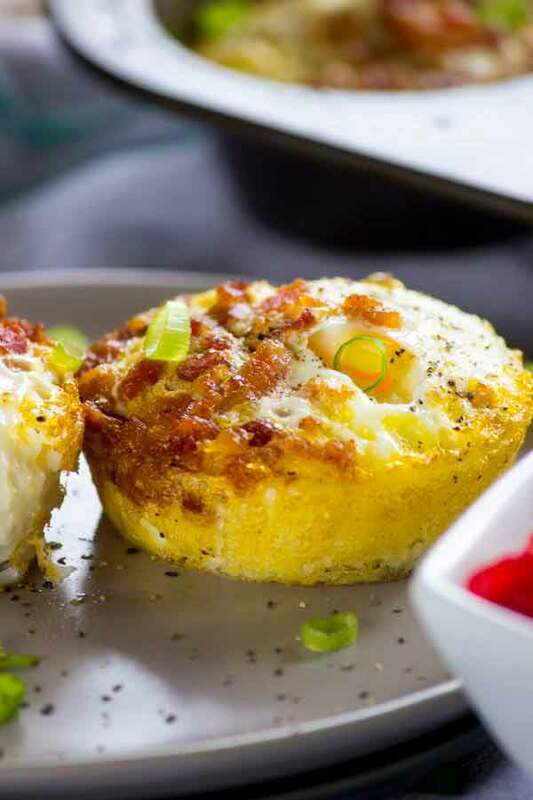 Break one egg into each muffin slot, then drizzle with about 1 tablespoon of crumbled bacon. Bake for about 12-15 mins or until muffin tops are firm. Carefully remove from oven and let cool for a few minutes before serving. Serve with green onions and/or sprinkle hot sauce for extra flavor.